Congregate meals offer nutritional and social benefits. They bring seniors together to enjoy meals. Seniors often have a difficult time cooking interesting meals for themselves. 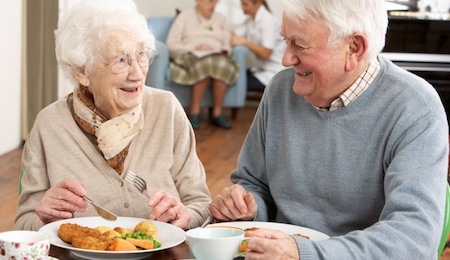 Our delicious meals provide great nutrition that will keep seniors healthy as well as providing an outlet where seniors can create friendships and get to know other seniors in their area. We offer transportation for seniors that are interested in congregate meals, but do not have the ability to drive themselves. Congregate meals also offer a social element. It can be very lonely for seniors who are living independently. When they go to have a congregate meal, they meet other seniors and can create friendships and relationships with them. Congregate meals can help build strong and happy social lives for seniors that wish to keep living by themselves. If you are interested in our nutrition services, give Self-Help for the Elderly a call to discuss how our Congregate meals can help you.